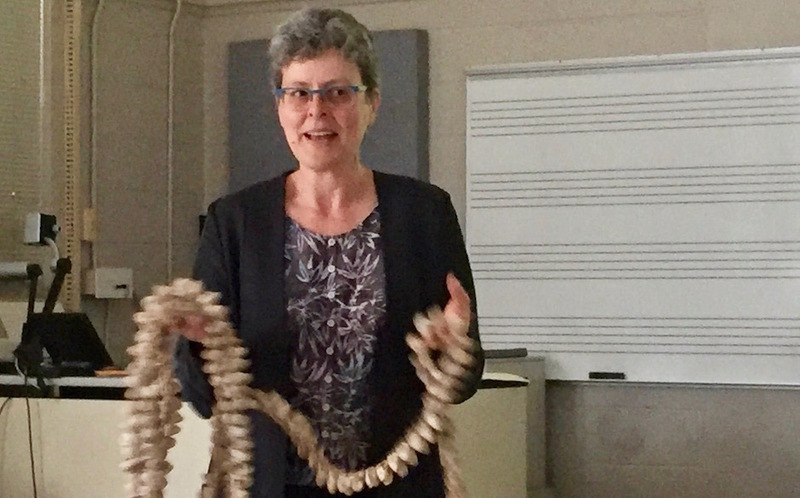 On Thursday afternoon in the Saunders Fine Arts Building, the MTSU Music Colloquium hosted ethnomusicologist Helena Simonett, a Senior Research Associate from the Lucerne University of Applied Sciences and Arts in Switzerland. Simonett gave a lecture titled “Yoreme Cocoon Leg Rattles: An Eco-organological Study of a Unique ‘Sound Maker,’” which analyzed the origin and significance of a cocoon instrument used by the Mayo-Yoreme and Yaqui indigenous groups in northwestern Mexico, specifically in the states of Sinaloa and Sonora. The lecture traced the history of indigenous groups in the region and the biology of the butterflies that create the cocoons, called mariposa cuatro espejos. Simonett discussed the changes to the region made by industrialization and climate change and how this affected mariposa cuatro espejos and the culture and traditions of the Mayo-Yoreme and Yaqui, both relatively isolated desert societies. The cocoon instrument, which makes a light rattling noise, is worn on the feet of pascola dancers during the ritualistic deer dance, in which the dancers attempt to channel the spirit of a deer to see the world through its eyes. Both butterflies and deer are revered symbols in the cultures and are closely tied with spirituality and virtues. The dances are part of religious events that include singing, dancing, music and food. Simonett says the way that the Mayo-Yoreme and the Yaqui incorporate the cocoons into their culture and spirituality and what it represents is more important than some may realize. “It teaches how we are part of and dependent on the Earth and our environments for our survival…challenging our assumptions about the durability of things and life itself. Rather than encoding their spiritual beliefs in impartial media, the indigenous people of northwestern Mexico carry them out in their ceremonies, which is how they renew the link of humanity with primordial power each time they are being performed, and in so doing, they keep alive the knowledge of their ancestors,” Simonett said at the end of the lecture. According to some, the Mayo-Yoreme and Yaqui can be very selective about sharing cultural information with outsiders. However, when asked how the indigenous groups welcomed her, Simonett says respect helps tremendously in learning about them in their home. The Music Colloquium hosts lectures on issues in music around the world. Their website is here.